July 2nd , the inital investigation was to check out charges of smuggling and violations of the Clean Air Act. The government always goes after the Clean Air Act. Everything is still in a holding pattern until any actual charges are filed. I also found out besides the "buggy" car that was not impounded(it had a VW engine in it), the black R34 had no driveline in it, so good luck getting anyone to compare car insurance for it. An engine is just a part. can you say witch hunt? skyline is a bad word at DOT/NHTSA and with CBP. This sentence is referring to the engine, not the body. I really hope things are turned around and it becomes much easier to import whatever you want. Hey, do you mind if I use part of your post for my automotive and towing blog? 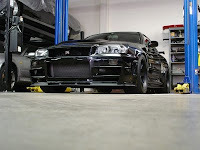 I just towed a GTR the other day on flatbed and it sparked something in me to write an article on the vehicle. Car Towing. No problem, just include a link back. thanks.